Here is a recipe I have grown fond of, using Alishan’s cornmeal. The vegan recipe is tried and tested and creates a flavourful, if slightly crumbly cornbread. The non-vegan is taken from Bob’s Red Mill’s homepage (the supplier of our cake mixes). 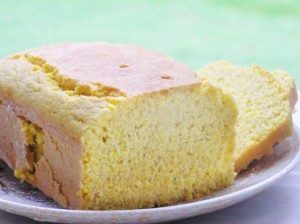 *If you would like a more bread-like cornbread switch the flour and cornmeal round; 1 cup cornmeal to 2 cups of flour. I also used our whole wheat bread flour (G01) and that worked well though the mix needed a touch of water. You should have a something like a thick batter rather than a stiffer cake mix. Then, in a large bowl, sift together the dry ingredients (cornmeal, flour, baking powder and salt). Add the oil and maple syrup to the soymilk mixture. Wisk with a wire wisk or a fork until it is foamy and bubbly, for about 2 minutes. Pour the wet ingredient into the dry and mix together. Pour the batter into the prepared baking pan and bake for 30-35 minutes, until a toothpick inserted into the center comes out clean. Slice into squares and serve warm or store in an airtight container (I have also frozen it with no ill effects).